Like Rodney Dangerfield, the E36 3-series never got the same respect as did the earlier E30 cars. And while turbo'd, today's Nice Price or Crack Pipe M3 may just add injury to that insult. When Terry Gilliam made the movie Brazil, he created a dystopian alter-reality in which the protagonist attempted to escape his claustrophobic existence through his dreams. Sadly for yesterday's VW Brasilia, there was no escaping its Crack Pipe price, although its seller probably never dreamed it would lose by a wooly 80%. That price may have been a bit delusional, which is a shame because while the Brasilia's horsepower was as skimpy as Rio beachwear, it was still one clean Vee-Dub. Today, let's go in another direction. BMW. . . M3. That name alone can make any auto enthusiast's buttocks clench in excitement and reverence. However, not all M3s have been created equal, and, not all of them have escaped suffering at the hands of the unclenched and less than reverential owners. Today's 1997 E36 M3 Coupe is an example of just such suffering. Coming around the side and getting a peek into the passenger compartment reveals a center dash-mounted tach the size of one of Flava-flav's bling clocks, and sport seats that look comfortably worn, but otherwise intact. And yes, it's a three-pedal car. On the downside, the storage webbing on the back of the driver's side looks to have been stretched way out of shape, but that's probably due to carrying all of this car's awesomeness. Okay, heading around the front and everything looks normal . . .wait a minute, over on the right side there's been a hole cut in the hood, and covering that is some sort of a scoop that looks like it might have been a prop in the movie The Road. What could be under that? Why, it's a turbocharger, apparently mounted above the engine and otherwise impeding the hood closing without that hole/debris hat. Okay, well, that's interesting, let's pop the hood and see what else has been done to this M3's 3.2-litre, factory 240-pony six. It has been rattle canned red. With no apparent masking, or concession to the colors of the wiring loom, or readability of the cautionary decal warning labels. Okay, we're not playing M3-360 anymore- game over, man. What the hell has gone on here? Not only is the turbocharger sticking off the engine like some kind of parasitic hobo snail, but the whole engine compartment appears to have been the unfortunate participant in a hippie's acid-dropping painting party. It should be noted that it's only an assumption on my part that acid dropping hippies would do something like this to a car. I have never been a hippie, nor have I ever dropped acid – being afraid that under the influence of the drug I might attempt to eat a booger, and potentially not my own. But back to the M3. You may have seen those TV commercials for the ASPCA- the ones with the frightened and tragic looking stray dogs and cats. That kind of thing tugs on both the heart- and purse-strings of any animal lover because, well, just look at them! As a car nut, this E36 makes me have a similar reaction, and if I had the nine grand the seller is asking, I'd seriously consider buying it just so that he doesn't do anything equally egregious to it like letting chimpanzees have a crap fight in it, or driving it while wearing a backwards cap. Unfortunately, I don't think he'd let me buy it. Seemingly not having fully come down from whatever high engendered the engine bay art fart, he has listed the car as ‘For Seel' which is an obvious misspelling of Seal- the fabulously talented musical artist and Heidi Klum boot-knocker. This raises two questions- why he thinks that only Seal would be able to appreciate his automotive artwork, and, why doesn't spell-check ever seem to work on Craigslist? Okay, so maybe it's not Seal but the Pokémon character, Seel, which of course totally makes more sense. At any rate, getting this BMW M3 out of the hands of the amateur-hour Bob Ross will cost $9,000. Sure it's a freakshow, but it does have potential for causing synchronized projectile vomiting by Roundel Club members at any Bimmer show, which could be fun. It also, in the words of Roberta Flack, has suffered enough. 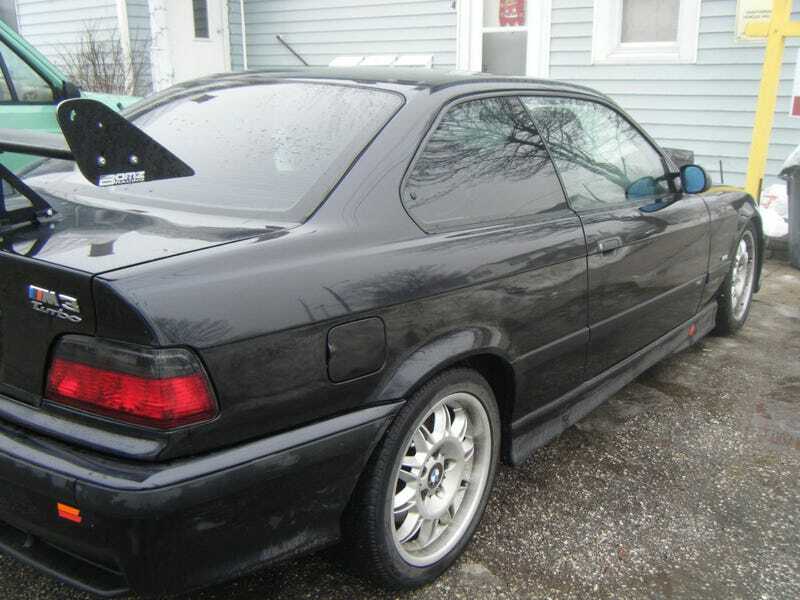 So what do you think, should this E36 M3 be saved for $9,000, or is it too far gone – and far too expensive - to be rescued? Sheboygan Craigslist or go here if the ad disappears. H/T to Bubb Rubb from Baltimore for the hookup!